Dental crowns are not an uncommon topic of conversation in the field of dentistry. However, if you are a patient who has never had to think about getting them until now, your knowledge may be limited. And because we know how important it is to understand the “whats” and the “whys” before you commit to any major dental work, we will answer your top questions about dental crowns. Question: What exactly is a dental crown? A dental crown is more like a cap that completely covers the visible part of your natural teeth or implants. Dental crowns are usually made of ceramic or porcelain which gives them a more natural appearance, although, there are dental crowns made of an alloy such as gold or even stainless steel. Question: Why do people need dental crowns? 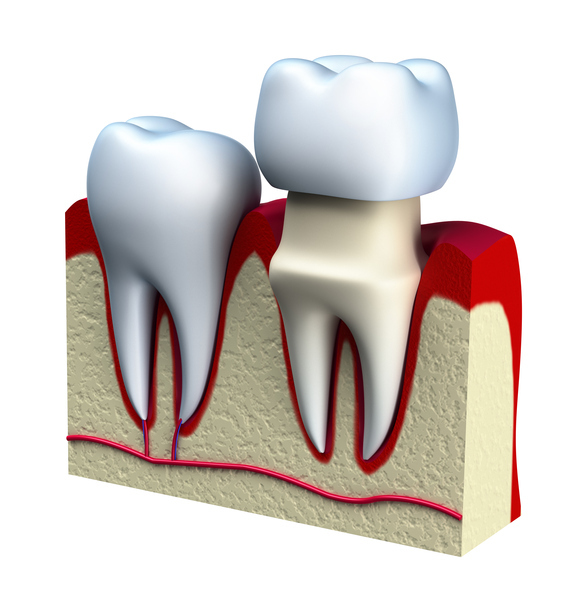 There are quite a few dental problems that dental crowns can solve. People often get dental crowns to strengthen and protect a damaged tooth, to replace a tooth after a root canal, and to improve their smile in general. Like we mentioned above, dental crowns are also used for dental implants. Some modifications will be performed by your dentist before the crown is placed over your tooth or implant. During this part of the process, you will be numb so you won’t feel a thing. You might feel a bit of achiness once the numbing fades but it’s really not that bad. Sometimes patients feel a bit of pain when their temporary crown is removed and the permanent one is installed. It’s because the air hits the exposed nerves. If you have had a root canal, you won’t have feelings in those nerves! Anyway, any pain that you might feel when you get a crown can be easily managed with over-the-counter medicines. Question: How do I take care of dental crowns? Dental crowns do not require any special treatment. Just take care of them like you would your natural teeth. Perform your regular oral hygiene regimen (brushing, flossing, and mouthwash) and there shouldn’t be any problem. Of course, you need to visit our dentist at least twice a year to maintain oral health. Question: How can I get a dental crown? If you believe a dental crown is what you need to fix your smile, you can give Dental Laboratory Associates. We make some of the highest quality dental crowns for some of the best dentists. We can refer you to one of our top partner dentists! This entry was posted in Cosmetic Dentistry, Dental Implants, Dental Restorations, dental tips and tagged cosmetic-dentistry, dental crowns, dental crowns advice, dental crowns tips, dental implants. Bookmark the permalink.